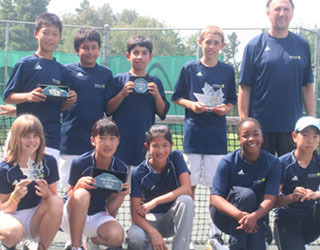 Tennis Mont Tremblant, Quebec, August 5 - The BC squad brought home the Boys`12 singles first place trophy and the Girls`12 singles second place trophy this year. The U12 Provincial Team, above photo: Front row, left to right, Rosie Johanson, Andrea Gu, Cassie Chung, Khadija Dumas Da Silva, and Ashley Zhu. Top row, Larry Zhao, Neel Phatepekar, Sam Gouneili, Benjamin Sigouin, and the coach, Dimitri Penchev. Photo 1 (left): Benjamin Sigouin beat Alexander Donski of Qu�bec, 6-3, 6-3 to win the Boys' 12 singles. This was a huge moment for tennis in the BC! The 11-year-old Benjamin became the first BC player ever to win the Boys' 12 Canadian National Championship. Photo 2: Rosie Johanson is all smiles after beating top-seeded Patricia Muamba, 6-3, 6-4. Rosie went all the way to the final where she lost to Charlotte Robillard Millette of Qu�bec, 6-3, 6-2, to settle for second place. The record for BC Girls at the U12 Nationals still belongs exclusively to Tracy Dong. Tracy won the event in 2007. Photo 3: From left to right, Alexis Galarneau (QC), Layne Van Buskirk (ON), Benjamin Sigouin (BC), Charlotte Robillard Millette (QC), Alexander Donski (QC) and Rosie Johanson (BC). Photo 4: The team was up and running on the courts from 7:10 AM each day for warm up and practice. Photo 5: Dimitri Penchev on the look out. Dimitri is BC National Training Center head coach (NTC) and he knows his team very well. Dimitri has PhD degree in coaching studies and many years of international coaching experience. He was with his team from early morning practices to late afternoon matches. His leadership and his dedication for excellence should be credited for the team success this year. Dimitri is 2010 High Performance Coach of the year. Photo 6: Jacques Brunelle, left, the tournament chairman, and Janet Petras, Tennis Canada, manager of National Events. Jacques was recognized for his excellent job in running the event. Photo 7: Parents break bread together. From left to right: Sarah Johanson, Julie Phaterpekar, Arezou Gouneili, Donna and Gary Giu, Ren Li, Sigouin, Miles Zhao, Mamood Gouneili and Dimitri Penchev. Missing in the photo: Gislaine Da Silva, Hubert Sigouin and Regis Chung. Photo 8: The BC team also have fun socializing. Photo 9: Players had a good time in between matches. Photo 10: John Albers is the man behind the scenes: court preparation, shuttle services both to and from the airport and from hotels to the courts. Each year the U`2 and U14 Nationals are played on green clay courts. Our team had only a few sessions of practice on clay courts at the Van Lawn Tennis Club a week or two prior to their trip to Quebec, whereas both Quebec and Ontario teams play on clay on a regular basis. This was a big handicap for the BC team. Luckily, Benjamin Sigouin played a tournament on clay in France just few weeks earlier. For the U12 Nationals it's recommended parents travel with the players because the level of emotion is high. The pressure of the moment, high expectations, and frustration at not carrying the day often cause meltdowns during or after the match. Even top players break down. Victor Krustev, the winner of 2010 Indoor Nationals and tournament top seed, broke his racket and almost his hand after losing to Alexander Donski, 6-2, 6-3, in the semis. He could not continue through to the play-off and settled for the fourth place. Internet connections in Mont Tremblant are not cheap and there are not many hotels which provide free WiFis. Make sure to check what�s provided before booking your stay. Also, grocery shopping in the village is expensive. There is an IGA within 10 minutes drive out of village with affordable solutions.